CAMAS — The power of a program. 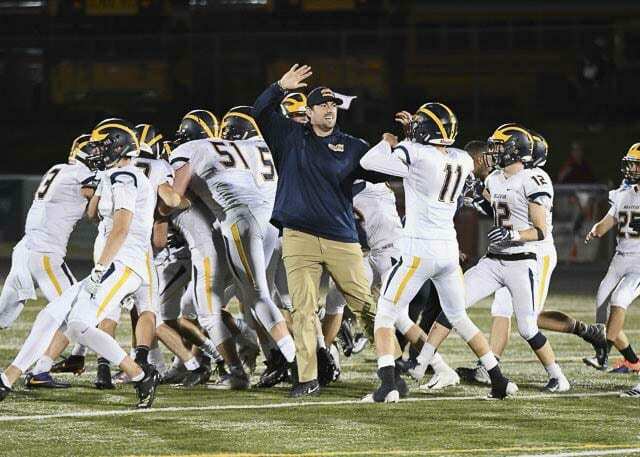 That’s how the Bellevue Wolverines described it. 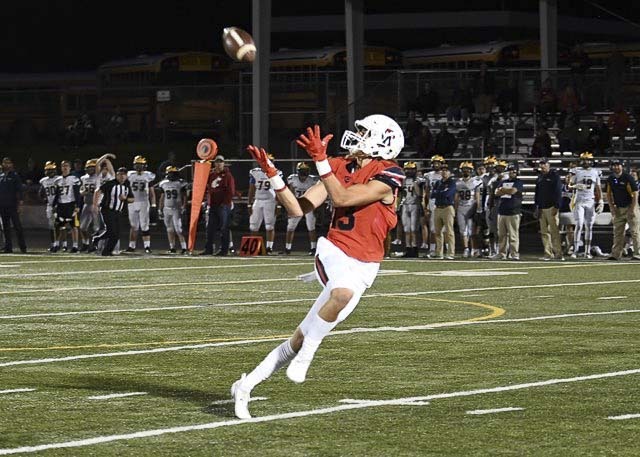 Trailing by 14 points midway through the fourth quarter, the Wolverines would score 24 points to stun the Camas Papermakers, winning it with a 41-yard field goal on the final play of the game for a 38-35 non-league victory at Doc Harris Stadium. Jed Michael knew he made his field goal as soon as the ball left his foot, he would say moments later. “This is so much fun. I’m still in shock,” Michael said. Perhaps not as shocked as the Papermakers, though. 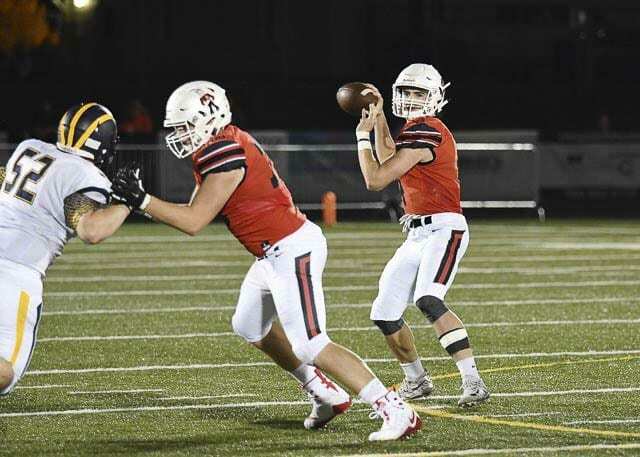 The Papermakers seemed to be in control of the game after the defense stopped Bellevue on three consecutive drives with fourth-down stops. Bellevue’s defense, though, also came to life, forcing a punt, a punt that would be blocked. That set up the Wolverines for the first of their 24 points in the final 4:49. The Wolverines recovered an onside kick and scored seconds later on a 53-yard run by Drew Fowler to tie the game at 28. Two plays later, a Camas pass was deflected into the air and Matulino caught it and rumbled down to the 6-yard line. Three plays later, Alex Reid gave Bellevue the lead at 35-28. This is Camas, though. The Papermakers have plenty of pride in their program, too. Andrew Boyle threw a perfect deep ball to Jackson Clemmer, who broke a tackle and was gone for a 63-yard score with 2:17 to play. Tied again. The Camas defense forced a punt, but the Wolverines intercepted a deep ball with 25 seconds left to play. Fowler ran for 12 yards, then 28. After a spike to stop the clock, Reid rushed for six yards to get Michael in position to win it. Boyle threw for 292 yards and five touchdowns. Luc Sturbelle caught eight passes for 143 yards and two scores for the Papermakers. Bellevue rushed for 469 yards, including 270 in the second half. The only pass was a spike to kill the clock. The Camas defense got a turnover on the first possession of the game, leading to a Boyle-to-Sturbelle 8-yard touchdown pass and a quick 7-0 lead. Bellevue tied it on its next series, but Boyle and Sturbelle, again from eight yards out, made it 14-7 for the Papermakers. Those two did it again in the second quarter, but this one was the bomb. Sturbelle was all alone behind the defense and Boyle found him for a 69-yard touchdown. Then Bellevue did its Bellevue thing with a 19-play, 92-yard drive to make it 21-14 at the half. For the next 18 game minutes, it was all Camas. The Papermakers got a 28-yard TD pass from Boyle to Clemmer, and the Camas defense had those three fourth-down stops in a row. The last five minutes belonged to Bellevue, though, including in the final second when the ball sailed through the uprights. “I knew I was going to make it,” Michael said. RUSHING: Bellevue — Joby Schneider 19-53, Fowler 16-192, Griggs 10-78, Reid 28-133, Bryson Sleeper 5-13. Camas — Randy Yaacoub 12-48, Boyle 2-3, Blake Derringer 1-2. PASSING: Bellevue — Sleeper 0-1-0-0. Camas — Boyle 16-26-2-292. RECEIVING: Bellevue — none. Camas — Sturbelle 8-143, Shane Jamison 2-8, Joey Schnell 2-21, Dawson Ingram 1-30, Clemmer 2-91, Yaacoub 1- (minus 1).